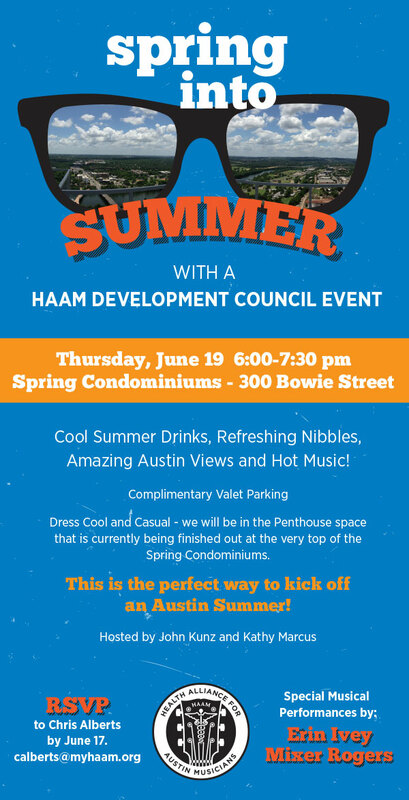 Being a proud HAAM member, I am honored to play their “Spring Into Summer” event for the HAAM Development Council. They will be raising money and partying hard, to the sounds of my Austin Centric mix and a very special and very dreamy performance by my favorite singer songwriter in the world, Mrs. Erin Rogers…I mean Ivey 😉 If you’d like to donate to a really good cause and party in the penthouse with us, RSVP to Chris Alberts by June 17 at calberts@myhaam.org. Hope to see you there. This entry was posted in Shows and tagged ATX, Austin, austin centric, Cam, DJ, erin ivey, HAAM, June, Live, Love, Mixer, Mixer Rogers, Music, myhaam, penthouse, Rogers, spring, Summer, Texas. Bookmark the permalink.